A lorry driver whose vehicle crushed and killed another motorist has been jailed. David Hare, 55 of Salisbury, was sentenced to 18 months at Lewes Crown Court today (Monday, September 4) and ordered to serve the remainder of his four year disqualification upon his release. This image of the crash scene has been issued with the support of the victim's family. Police say Steven Copping was driving his Volvo V60 east on the A27 near Polegate when it was struck by a 41-tonne heavy goods vehicle, carrying scrap metal, travelling in the opposite direction On March 5, 2015. The HGV, driven by Hare, overturned and crushed the Volvo, instantly killing Mr Copping, 51, of Hildenborough, Tonbridge, Kent. Hare was subsequently arrested and charged with causing death by dangerous driving. He denied the offence, and the case went to trial on two separate occasions – firstly in September 2016 and again for retrial in June this year. On both occasions, the jury could not agree upon a verdict and a hung jury was declared. Steven Copping was described as an 'amazing dad, and a loving and devoted husband'. However, at the retrial Hare pleaded guilty to the lesser offence of causing death by driving without due care and attention. 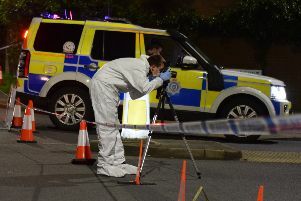 According to Sussex Police, the jury heard evidence from witnesses who recounted the horrific collision and the aftermath, describing how Hare loaded his lorry in Hailsham and travelled south on the A22, exceeding the speed limit (56mph on a dual carriageway restricted to 50mph for that class of vehicle). Having turned on to the A27 westbound, the court heard he accelerated, again exceeding the speed limit (55mph on a single carriageway restricted to 40mph for that class of vehicle at that time*). Just prior to a bend, he failed to apply sufficient steering and lost control of his vehicle, causing it to leave the carriageway and overturn on to Mr Copping’s car, directly leading to his death. The prosecution also presented evidence of mobile phone usage during his journey, which revealed that Hare had deleted his call history before his phone was seized by police. Hare’s sentence was reduced for a guilty plea. Sergeant Dan Pitcher of the East Sussex Roads Policing Unit, said, “Throughout the case the investigation team has examined mobile phone data, data from the vehicle’s tachograph and engine electronic control units. “Our focus was to find out what caused or contributed to the collision and ultimately the tragic death of Steven Copping. “In addition to this we have supported the family during the investigation and our thoughts are with them during this difficult time. “This case is a stark reminder of how vulnerable we are as road users; Sussex Police will relentlessly pursue those who break the law, which in this case had devastating consequences. - And failure to wear a seatbelt. Present in court throughout the trial was Mr Copping’s family. His wife Karen said in a statement: “On that fateful day on March 5, 2015, Steve went happily off to work. “We didn’t for one second imagine that he would not be returning home to his loving family. Since that day we have suffered unimaginable pain through our loss. “Steve was an amazing dad, and a loving and devoted husband. He was funny and friendly with a massive heart. He was loved by many and they have been a huge support to us always. “I know that Mr Hare did not set out that morning to kill Steve but he did; through his actions we, as a family, are forever bereft. “Nothing will bring Steve back home to us, but justice has taken its course and this gives us some solace. Our future will be marred by his absence and that will always be. He was taken from us so cruelly. “As a family we would like to thank our CPS prosecutor Mary Walford for her conduct of the prosecution; she has been thoroughly professional and respectful throughout. “Sussex Police’s Roads Policing Unit officers have been amazing from the outset and have continued with their hard work and support ever since. Sergeant Dan Pitcher and his team are a credit to the police force, and should be commended for their hard work and compassion throughout the last few months. *At the time of the incident (March 2015), the speed limit for HGVs on a single carriageway was 40mph. This changed to 50mph in April 2015.